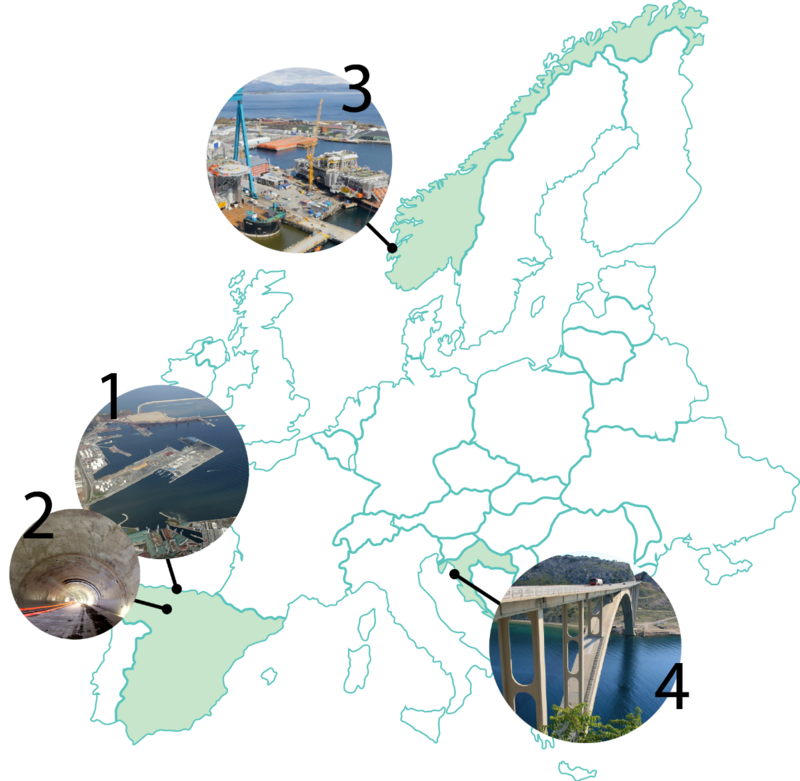 Ordinary Portland cement has been considered for many years the benchmark structural material for durable buildings and infrastructures, as well as for marine environments. However, its production process consumes significant mineral resources (good-quality limestone and clay), energy and fuel, and creates greenhouse gas emissions. Various efforts are underway to improve the environmental friendliness of concrete, by integrating supplementary cementitious materials (SCM), such as by-products of industrial processes. Nevertheless, current state of the art sustainable solutions based on high substitution rate of Portland cement clinker by SCM occasionally lead to limited performance and durability of concrete structures, particularly critical when applied in harsh conditions. All these aspects affect also the resource consumption, waste production, environmental and economic costs of repair and replacement. In this framework, EnDurCrete Project aims to develop a new cost-effective sustainable reinforced concrete for long lasting and added value applications. 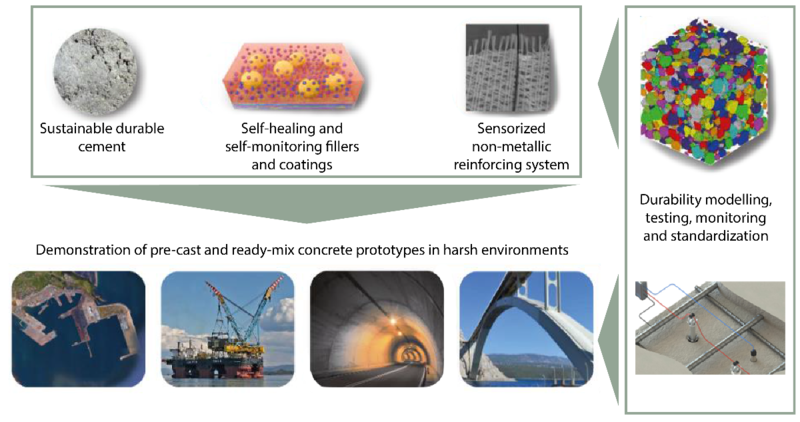 The concept is based on the integration of novel low-clinker cement including high value industrial by-products, new nano and micro technologies and hybrid systems ensuring enhanced durability of sustainable concrete structures with high mechanical properties, self-healing and self-monitoring capacities. → Novel cement, by including sustainable, high-quality supplementary cementitious materials (classified coal combustion fly ashes and ground granulated blast furnace slag). → New multifunctional coatings enabling concrete self-healing properties based on resin microencapsulation and protecting both concrete and rebar from aggressive agents. → New smart fillers based on nano-modified clays, for anti-corrosion properties and based on micro carbon-based materials (such as carbonaceous inerts like char and the finer fraction of a used foundry sand, derived from industrial by-products) for mechanical and self-sensing properties. The structural self-sensing properties will be complemented with environmental sensors casted in concrete. → Concrete non-metallic multifunctional reinforcing systems, based on technical textiles integrated with optical-fibre sensors, enabling both structural reinforcement and continuous structural health monitoring. The systems will be optimised aiming at a proper trade-off between productivity, robustness, and concrete reinforcement adhesion. → Advanced non-destructive continuous monitoring and testing tools and procedures, including technologies tuned for the self-sensing concrete systems. Durability properties of the components will be assessed and monitored. The new developed tools will be integrated by conventional durability testing procedures. → Coupled experimental and computational approach for theoretical and experimental understanding of factors affecting durability. Modelling and simulations applied at micro-mesoscale are carried out defining representative elementary volumes of cement paste, mortar, and concrete as well as modelling applied at macroscale is performed representing the whole concrete infrastructures. These continuum models are solved by finite elements analysis. The combined experimental and computational approach will enable long-term durability assessment and resulting service life prediction of the target infrastructures exposed to severe environment. Demonstrators will be tested in working sites of tunnels, ports, and offshore structures, in order to prove the enhanced durability (+40%, i.e. +30 years) and decreased cost (-35%) of the new concrete systems in such critical applications. Innovation aspects such standardization, life cycle assessments, health and safety and training activities will be performed.